This is a big day for Dunkin’ Donuts and Baskin-Robbins, as Dunkin’ Brands officially goes public. Today, I’ll have the honor of representing the company in New York City as “DNKN” is listed on the NASDAQ Stock Market for the very first time. As part of our celebration today, I am tremendously excited and a bit humbled that our brands’ iconic images will appear high above Times Square on the NASDAQ MarketSite Tower. I’m honored that NASDAQ is unofficially changing its name for today only to “NASDDAQ,” with a special new logo incorporating Dunkin’ Donuts’ famous pink and orange Ds on their electronic signage in Times Square and on the official NASDAQ website. 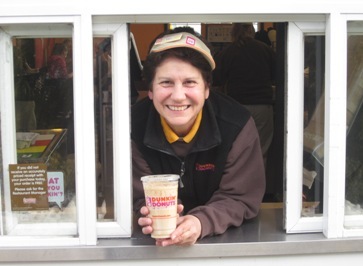 A Dunkin' Donuts Crewmember from Falmouth, Massachusetts. First and foremost, I want to thank our incredible community of domestic and international franchise owners, operators and crewmembers. Between Dunkin’ Donuts and Baskin-Robbins, we currently have more than 16,100 restaurants worldwide, which are owned and operated by individual franchisees and licensees. We couldn’t be happier to have a team so committed to our guests and the communities they serve. 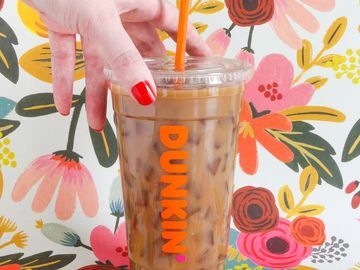 It’s their friendly service that our guests have come to expect with their morning coffee, or afternoon ice cream, that keeps Dunkin’ Brands running. Baskin-Robbins' 4,000th international location, in Novena Square, Singapore. Also fueling our company’s growth, are all of our Dunkin’ Brands employees. I joined Dunkin’ Brands in 2009 and am thrilled to be surrounded by such an amazing group of people every day. Their remarkable dedication to our company brings to life everything that is special about our brands. 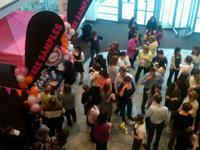 An aerial view of a sampling event for Dunkin' Brands employees. 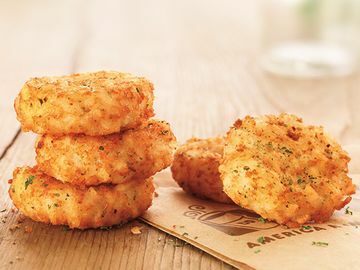 Each month, employees get to sample new Dunkin' Donuts food and beverages, plus the Baskin-Robbins flavor of the month. But most importantly, I want to thank you, our Dunkin’ Donuts and Baskin-Robbins guests. This day is a testimony to the loyalty and passion you have shown for both brands from the very beginning. As we continue to grow, our most important responsibility remains the same: to provide you with friendly service, plus delicious foods, ice cream and beverages, all at great value. 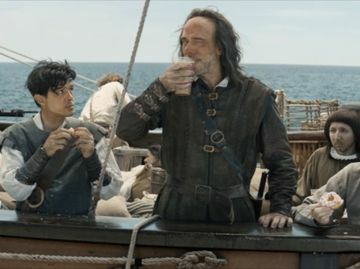 An example of the passionate guests Dunkin' Donuts and Baskin-Robbins have. All photos were submitted by Facebook fans of each brand to the companies respective Facebook pages. As we approach our NASDAQ Listing Day Ceremony today, I’ll be thinking of Burton Baskin, Irvine Robbins and Bill Rosenberg for setting the foundation for our two iconic brands. 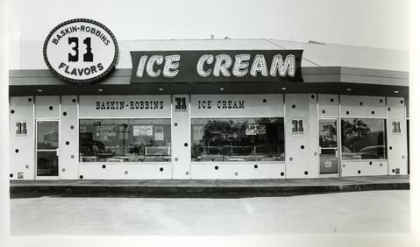 An early Baskin-Robbins shop in North Glendale, California. Baskin-Robbins was founded in 1945 in Glendale, California, by two ice cream enthusiasts – Burton Baskin and Irvine Robbins – whose passion led to the creation of more than 1,000 ice cream flavors and a wide variety of delicious treats. More than 60 years ago in Quincy, Massachusetts, Bill Rosenberg opened the very first Dunkin’ Donuts. 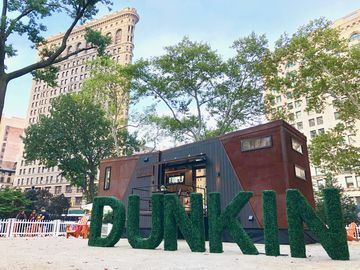 Now, Dunkin' Donuts is one of the world’s most recognized brands and is the world's leading baked goods and coffee chain, selling almost 2.5 million donuts a day and more than 1 billion cups of coffee a year. 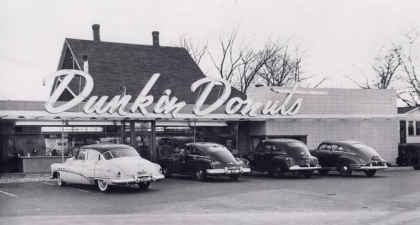 The first Dunkin' Donuts restaurant in Quincy, Massachusetts. Today, we honor our heritage and celebrate Dunkin’ Brands’ exciting future. I look forward to sharing the future with you.